Associate membership in the Organic Council of Ontario doesn’t result in a tax receipt. Donations and membership with OCO are not tax deductible. This statement seems an odd way to open up a conversation around the need to contribute financially to the work of OCO. Afterall, there are many competing options for donation and membership dollars with organizations who are a registered charity. OCO explored all of our options when we conceived of our Sustainability Plan. We can’t do all the great work we do on behalf of the organic movement without core funding. As our biggest opportunity for support is our “eatership”- those people who want clean food produced by economically and ecologically sustainable family farms- we are reaching out to find 5,000 organic enthusiasts in Ontario just like you to support our work with an annual membership of either $25 or $100. Registered charities have extremely tight restrictions on the nature of their work. Much of the work our movement needs OCO to do falls beyond the narrow scope of acceptable activities of organizations with charitable status. And with the ongoing pressure under the current federal government on activities for organizations opposed to Harper policies, charitable organizations focused on environmental advocacy are facing a $20 million federal “witch hunt” announced as part of the last Omnibus bill. This is not an environment in which OCO wishes to operate. We need a strong provincial organization to have the difficult conversations that lead to policy and purchasing changes. We advocate for changes to current rules, we challenge current regulatory regimes (like the inadequate testing regime for GMO approval at the federal level), and we support commercial promotional activities. Our trade members need us to be free to express what needs to be expressed. Sometimes that involves political activity. Sometimes it involves rallying voices within industry and the public, as we did to ensure organic turkey production could continue in Ontario. With charitable status, none of that work would have been possible. OCO is seeking to loosen, not tighten, the restrictions on what our organization can do and say in an effort to move us along the sustainability continuum. Tax advisors at www.thesimpledollar.com suggest that charitable donations are a great thing and they do offer some tax savings, but you don’t save $1 for every dollar donated. Instead, charitable giving reduces one’s tax bill roughly a quarter or so for every dollar you donate. For the $25 or $100 OCO is asking we are talking about foregoing a tax savings of $7 or $25, but given the trade-off in terms of restrictions on the activities the movement needs OCO to undertake, we believe Ontarians can see the value in our non-charitable activities. OCO is a registered non-profit membership based organization. 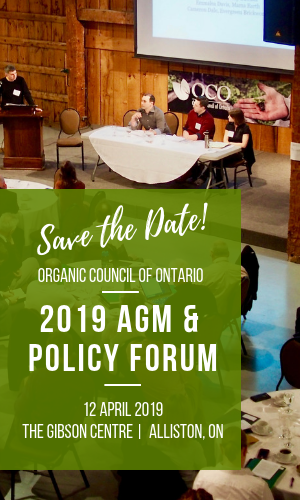 OCO with the support of its members and direction provided by the member-elected board, work towards shifting Ontario towards more sustaining and organic agriculture. This requires a full-time effort and funding through membership is critical for OCO’s office to remain in operation. Please join our membership today, click here to join.